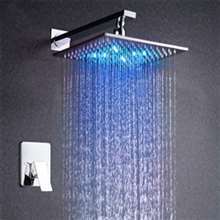 This 40" Stainless Steel square Color Changing LED Rain Shower Head goes equally well with traditional and contemporary decor and can be particularly effective for rustic look, or as a neutral for traditional-style baths. The lights will dim and brighten when you lower and raise the pressure so you can set the perfect mood, water and light. 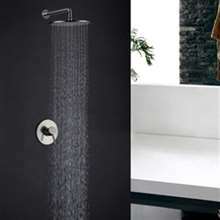 Modern Stylish Design made to match or stand out from your other bathroom fixtures. The LED lights on this shower head works fine compared to the LED lights on our old shower head. The lights on this one seem to be brighter and much more noticeable. I noticed that there are more LED light bulbs on this one, too compared to our old LED shower head. 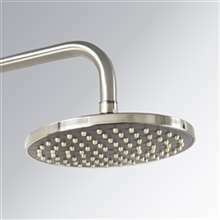 This shower head is huge, so I would suggest you look at other options if you have a rather small bathroom. Anyway, I think this is a good item, the LED lights especially. They're bright enough to be visible and they really do add a nice touch to the shower. It's kind of expensive though, but I think it's worth it. 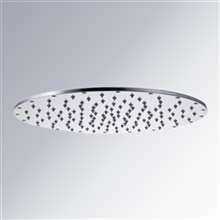 One of the things that attracted me to this shower head is the LED light system. But I think I was expecting too much out of it, so that's why I'm feeling pretty dismayed when I saw the lights. They were quite dimâ€”they do light up, but they're not as bright as I hoped they'd be. Aside from that though, there's really nothing else to complain about. First off, the delivery was a day late. This wasn't much of a problem though since we were waiting for the weekend to have it installed anyway. As for the product itself, I think it's actually great. The LED lights of course were the main attraction, and I think that they work really well. I was kind of hoping they'd be brighter, but now I think they just fine as they are. I never thought I'd really enjoy showering with this one, but I actually do. 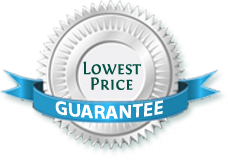 It were my daughters who wanted it, and being a good parent I gladly got them one from here. Well, it did look pretty cool when I first tried it, and learned to like it even more after a few more showers. I actually enjoy using it come night time after a long day at work where the lights look brightest. They okay, but not very bright during daytime especially if you have a really large window in your bathroom.